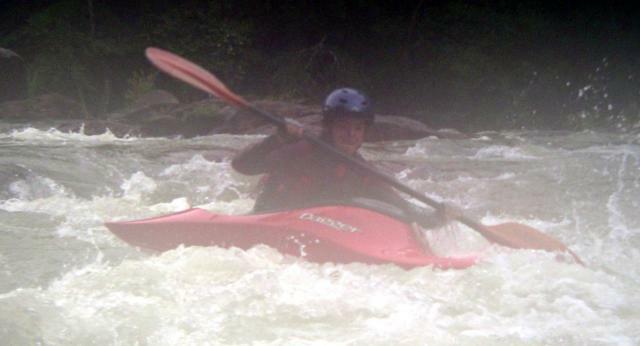 With rain recently the Nolichucky was starting to hold pretty good, so several of us set a trip for Good Friday of Easter Weekend (which we have traditionally called Easterchucky weekend in our local paddling club). Friday dawn a bit gray and overcast with forcasters predictions of heavy rains late evening, but advising a nice sunny day till evening. So met up at the takeout campground, arranged shuttle, and headed over the mountain to the put in. Quickly putting on we where starting to wonder about our day, it was suddenly turning cold to the point you could see your breath, and we had just had a frog strangler of a downpour. Well about the time we started to warm up at the play wave just below the railroad bridge above entrance rapid, the skies clear, sun came out, and it turned into a beautiful warm sunny day for early April. Jerry H. in K-1, Mac R. in K-1, Mike in k-1 and myself paddlin-ed in K-1 made up our group. We had a modest but good level in the range of 1400 to 1450 cfs. 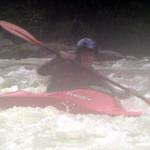 After surfing the wave above entrance/railroad rapid we turned downstream and began working down this initial rapid. Mac and Jerry entered a bit right of center, I peeled out of an eddy on the right bank and moved over to catch a chute just off the rocks on river left, moving down along the left rock formation and then pulling right and passing to the right of the boulder dividing the river below the rock ledge and then ferrying back to the eddies along the left bank. Mac and Jerry had caught an eddy on river right across from the boulder at river center and then made ferries behind the boulder and down river left. I peeled out of the high eddy on river left and did a ferry across the flow and out the right end of the hydralic below and eddied out on river right. We all surfed at bit in the out flow waves. Next we dropped down the top chute in “On the Rocks” all three of us making the left line below, which was taking a bit of effort this day as the current was pushing everyone into the left pillow off “the rock”. I caught the eddy behind “the rock along with Mac and played down the left run out. From here we all played down to “Jaws”, where there was minimal surfing, as water was still pretty cold. Leaving “Jaws” we worked down river left and ran out into boogie water area below, loaded with features to play though, and then on to “Pearl Gates” and on down to the staging eddy on river left for “Quarter Mile” rapid. We all surfed down the tougue to the pool above Hungry Jack ledge hole and ran the left line. I got blown off the hooking tongue a bit and bashed the end of the hole, turned right and ferried behind “Frances and Ivan” rocks over to the eddies on river right. Jerry ran down and joined me. Mac headed down going back to river right. I ferried out and across to run down river left, dropped a low ledge just above the boulders mid river and caught the eddy along the left bank, Jerry followed into the eddy. From here I ferried out to the boulders mid-stream and work eddies down and around and then across to river right just above the drop below. From here we all dropped down through the ledges and chutes working and playing the river to just above Murphy’s ledge and then ran out the drop down a chute on river right. We played our way on down to Rooster-tail, where we ran the far right entrance and skirted behind the pour-over rock to catch the back flow eddy behind it and then each picked our routes down to the dog-leg below. 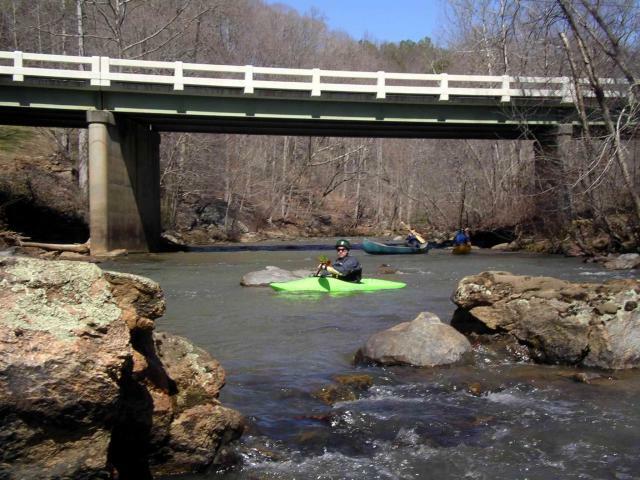 After catching an eddy at the boulder row on river left, I ferried out and caught the dog-leg entrance far left down the hook of the tongue headed hard left into the platform eddy below a ledge just left, then ran out the bottom of the rapid. From here we took a break at the beach on river right below. Back in our boats we headed on down through several nice boogie water rapids with nice play features we stopped to enjoy briefly, then on to Roller-Coaster rapid, where we all picked our own routes to run and surfed the waves at the bottom on river right. Continuing on downstream we worked the many smaller rapids, ledges, holes, and waves down the long straight-away down to Doo-Doo hole, ran the boiling entrance above and then out the ledge chute past the hole. From here we worked down to Rock-Garden and took our turns working, boofing, and banging down to the pool below via various routes we each selected. Then on to Hole-in-the-Wall, where we each worked various routes down to the main ledge and then ran just right of the rock out crop right of center, angling back left to slice through the narrow end of the hole, that opens up to a nasty keeper back toward the right bank, and into the eddy below the ledge. Then after running out the bottom drop we paddled the pool below down the the bend right entering Sousehole. At Sousehole we all pretty much entered the bend to the right and then caught eddies just above the Sousehole and ledges, then peeling out and ferrying back to river left and out. Below Sousehole we paddled and played down the three long sections between bends where there is an array of holes, low ledges and line hydraulics, diagonals, and various features to play along the way. Arriving at Twin-Eddies and running this last major rapid, we stopped and each played the hole below a few times each. By this time it was starting to get cool again and signs of severe weather moving in fast where visible, so we made a quick paddle down through the boogie water to Cherokee rock and across the pool to the campground and takeout. After changing and packing up we headed home, and found we where wise not to stay longer on the last part of the river as winds and downpours hit just after we packed up and started home. Where was I? I know I’ve lost a lot of weight, but I do paddle a big yellow boat. I noticed you guys kept staying out ahead of me, but I thought you knew I was back there. Well, my oversight, I evidently didn’t write it down imediately and looked at the pictures for people. I’ve been a little (about 4 months behind and trying to catch up). As it was cold everyone was blazzing down ahead of me which makes it hard to get pictures if I don’t get a chance to get ahead and have time to get a place to set up and get my camera out. When that happen then I end up with mostly people surfing when we stop. Next time make sure we arrange a couple of set up with me going down ahead and I will make sure you see some good pictures. Your name has been added to the role on the blog and picture captions.